June is my month of ease. In last week’s post, I wrote about the fact that you need to know how something feels to be able to create and grow it. You need a felt definition to make it real in your life. A negative definition will lead to a result of deficiency or lack. A ‘positive’ defition (read: working for purposes of bodywork and body awwarness) is one that wakes up your senses and awareness and brings whatever you want into your lived experience. You can only grow what exists and feels real to you. And your body is the anchor of your goals, your intention. So, what is the next step in bringing more ease into your day-to-day life? 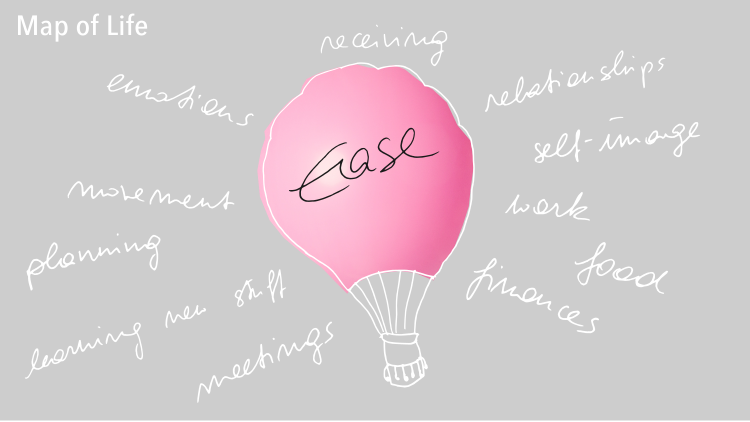 Now that you know more clearly how ease shows up in your experience, you can explore in which areas of life or situations you have it, where you would like more of it and where you’re missing it at the moment. We’re continuing the journey by drawing a Map of Life. 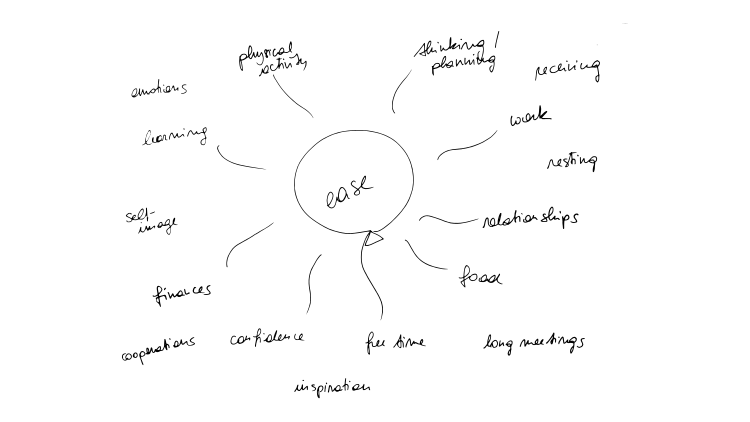 I’m inviting you to make a Map of Life, or mindmap, around the subject of ease. It helps you get a fuller picture of your situation. Sometimes when we reflect and make it real by putting it on paper, we realize that we have more of it than we think or that we thought we had it, but come up with areas in life where we actually miss it. You can write down any area of life or situation that you can think of. There’s no rules really. Afterwards, rate each area or situation from 0 to 10. When you’re done, you can pick one area or situation that you want to focus on in the coming week. This can be an area where you already have a good level of ease and would like to grow it. Or it can be an area where you are in need of more ease. And once you chose the area, you can choose times or moments, when you check in with your body with the intention of ease. When you catch yourself being unease, take a few breaths and remember this wonderful flowy and flexible feeling [insert your definition here]. What has this little exercise done for you? Do you feel different now? Do you have a better idea what situation or area of life you want to give more attention when it comes to being at ease? Do you have more questions? Were you surprised? If you want to share a thought, insight or experience, feel free to comment below. Go explore! And be your awesome self! 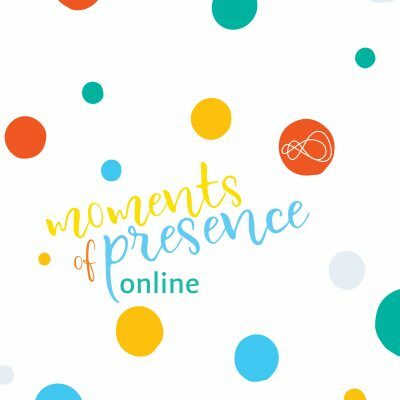 If you feel like some company on the way to ease, you can get My Summer of Presence now, either for 10 or 30 days. 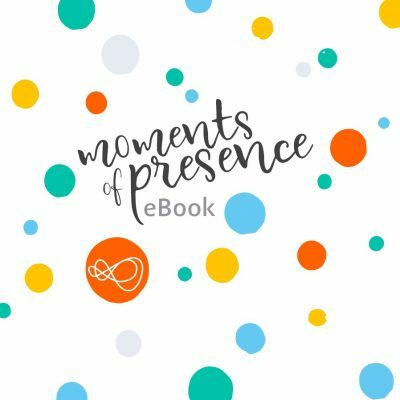 It consists of daily inspirations that invite more presence into your life. Check out this page to find out more. I will also be offering an intensive weekend in late June/beginning of July.